Hudson, NY - April 28 - 29 will mark the return of 24-HOUR DRONE: EXPERIMENTS IN SOUND AND MUSIC. An adventurous collaboration between Basilica Hudson and the Netherlands’ Le Guess Who? Festival, 24-HOUR DRONE is an immersive, all-encompassing event featuring an international roster of musicians and sound artists collaborating and experimenting in electronic, psychedelic, classical, non-western and instrumental drone music to create a full 24 hours of unbroken sound. 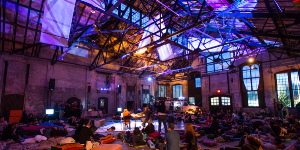 Set in the round against the raw, industrial backdrop of Basilica Hudson’s solar-powered reclaimed factory, with the spectacular Hudson River and Catskill Mountains on the horizon, 24-HOUR DRONE is the inaugural event of Basilica Hudson’s 2018 season, and one which captures the multi-disciplinary arts center at its most experimental and experiential. Drone is recognized as one of humanity’s earliest and most elemental forms of music. It is essential to indigenous musical traditions worldwide and has had a profound influence on modern music. Inspired by this minimal and ancient form, the organizers of 24-HOUR DRONE strive to connect diverse musical communities and traditions by offering a localized snapshot of drone in a long-form, endurance format. As in previous years, organizers have launched an open call for artists. With experimentation at the core of the event, organizers are firmly committed to expanding their network via this process and ensuring that 24-HOUR DRONE remains an open and welcoming platform for artists. The call invites those with a particular focus on self-contained, experimental, ambient, sustaining sounds to participate in the event. Collaborations are greatly encouraged, including first-time and previously untried projects. Artists can submit their information at http://bit.ly/DRONE18opencall. Basilica Hudson is also inviting donors to underwrite artist performances and help raise funds towards the ambitious 24-HOUR event. All contributions are tax deductible and will go directly to artist fees. Interested donors can learn more at http://bit.ly/dronerdonors18. Tickets for 24-HOUR DRONE are available at basilicahudson.org for $36 + fees. Basilica Hudson is a non-profit multidisciplinary arts center in Hudson, NY, supporting the creation, production and presentation of arts and culture while fostering sustainable community. Founded in 2010 by musician Melissa Auf der Maur and filmmaker Tony Stone, Basilica Hudson makes its home in a spectacular solar-powered reclaimed 1880s industrial factory on the waterfront of the historic City of Hudson. Weekend destination events comprise the core of Basilica Hudson’s music, performance, film, food and literary programming, alongside regular film screenings series, art exhibitions, and other community gatherings. Le Guess Who?, Basilica Hudson’s curatorial partner in 24-HOUR DRONE, has become the Netherlands’ go-to event for experimental, collaborative and otherwise out-of-the-box musical thinking. Now in its eleventh year, Le Guess Who? 2017 was presented November 9 - 12 in Utrecht, Netherlands. Visit basilicahudson.org for more information on this and other upcoming events this season.